1939 was an important time in the life of my parents, Irene and Tucker Bowen. They had been married 8 years and had no children but both of them desperately wanted one. Irene had a malformed uterus and so she went to the doctor who worked on her and miracles do happen because she conceived after only one year of treatment. They were both so happy to be able now to have a child. My mother had a good pregnancy and one morning before her due date she went into labor. I was delivered by a Catholic doctor named Hebert. I only weighed 4 pounds and was in very delicate condition. My skin at the joints was extremely thin almost translucent. There was a virus in the nursery and my Aunt, Jessie Howe had a good friend who a Catholic nurse was named Ms. Buffalo. My parents were not Catholic, but my aunt had married a Catholic man and had converted. Ms. Buffalo and my aunt started a novena to St. Therese, the little flower for my life. I was moved out of the nursery into a private room with another child, James Campbell, and Ms Buffalo took care of us 24 hours a day until we survived. After about 9 days I was stable enough to go home. My parents were elated and my father told my Aunt that he thought that because she prayed so hard that I was saved from death. My Aunt made one request that I be baptized Catholic when I was okay. My parents agreed. This was very difficult since my grandfather Bowen was a Baptist preacher and song director. When I was 4 years old my Aunt Jessie became very ill with pneumonia and the doctors told her she was not going to live. 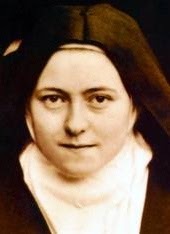 She called in my parents and told them that if she died she would not go to heaven because she had promised the Lord and St. Therese that if I lived she would see that I was made a Catholic. My father told her that if she lived the next Sunday she went to Church I could be baptized and he and my mother would see to it that I was raised as a Catholic. The doctors never understood how my aunt lived but 4 weeks later I was baptized at St. John’s Catholic Church by Father McCoy. True to his word my father and mother let me attend Mass every Sunday with my aunt. My father went to war as a sailor and my aunt again prayed protection for him to St. Therese. He came home safe and sound. Now it was time for me to go to school. My parents enrolled me into St. John’s Catholic School. They were still not Catholic. The Sisters of Mercy were good friends with my aunt Jessie and they took special care of me. I was allowed to go into the sacristy and help with setting up for Mass when I was in the 2nd grade and continued until I graduated from the 8th grade. They helped me deepen my prayer life. When I was 7 my mother again became pregnant and this time they had a baby boy, Bill. I so wanted him to be Catholic and prayed for that favor. My parents enrolled in Instructions of the Catholic Church and after taking it 2 times they joined the Church along with my little brother. Aunt Jessie was God mother to us both. I loved St. Therese and the Blessed Mother. They had a great influence on my life. Many times I have asked for intercession and have been sent roses. Another story of intercession occurred after I was grown and became Director of Nurses at the hospital where I was born. We had a terrible shortage of nurses and we were in trouble just having to cover the shifts. Sr. Mary Declan and I began our novena to St. Therese. On the third day, I came into my office and there on my desk was a vase containing 3 beautiful red roses. The card read, Congratulations on your promotion to D. of N. They were from friends who had moved away and came into town on a visit and were told of my accomplishment. This was 8 months after I was given the job. I showed them to Sister and we both were very excited. On the 9th day of the novena, I had a call from a nurse who had just moved to Hot Springs and wanted a job. I interviewed her and hired her immediately. Two days later I had applications from 2 other R.N.’s. I know that the intervention of St. Therese was heard by the Lord and answered. When they closed the school of nursing at St. Joseph’s Sister Humbeline gave me the original copy of the autobiography of St. Therese which I still have. When they redid the church at St. John’s they sold the statue of the Little Flower to a lady from Chicago. 3 years later she called me and was moving and knew of my love for St. Therese and asked if I wanted it. Needless to say I was overjoyed. She sits in my home now and when you look into her eyes (they are brown and made of marble) she looks back at you. My children have all grown up with the influence of St. Therese. After 25 years of marriage my husband Joe became Catholic and was grand knight of the Knights of Columbus. He made Cursilla two years later. He then felt called to become a deacon and was accepted and ordained 20 years ago. He has faithfully served since that time. During his preparation we received many roses during difficult time. St. Therese and Our Lady have been my close companions all of my 75 years of life and I feel sure they will see me in Heaven when my time comes.